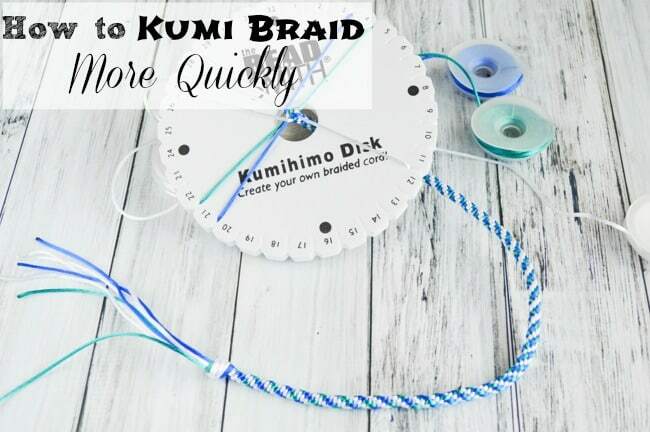 Discover how to kumihimo braid more quickly with your braiding disk using this simple trick! 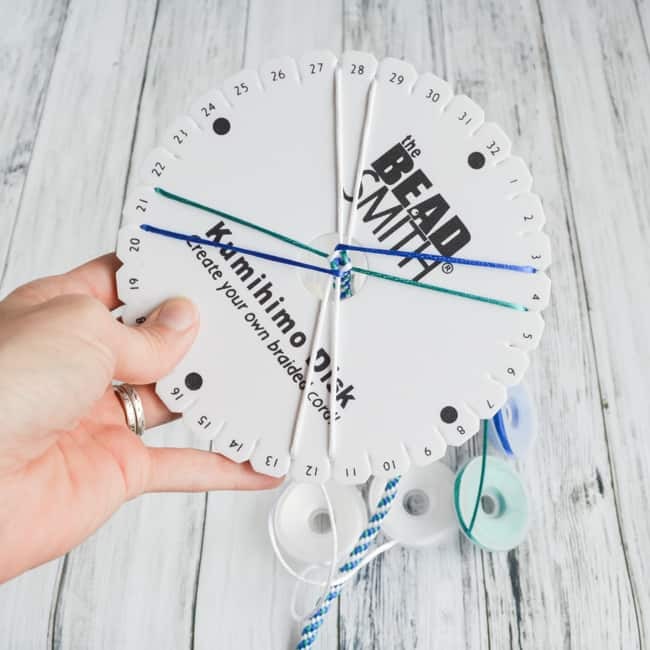 I’ve been intrigued by kumihimo since the first time I saw a book on it while hanging out at Barnes and Noble. This probably isn’t surprising to most people who know me because I have a lifelong reputation in my family for “tying things to other things” and it’s clear that I still love knots! My husband made me a lovely wood marudai, but a foam braiding disk is much more convenient for everyday use. 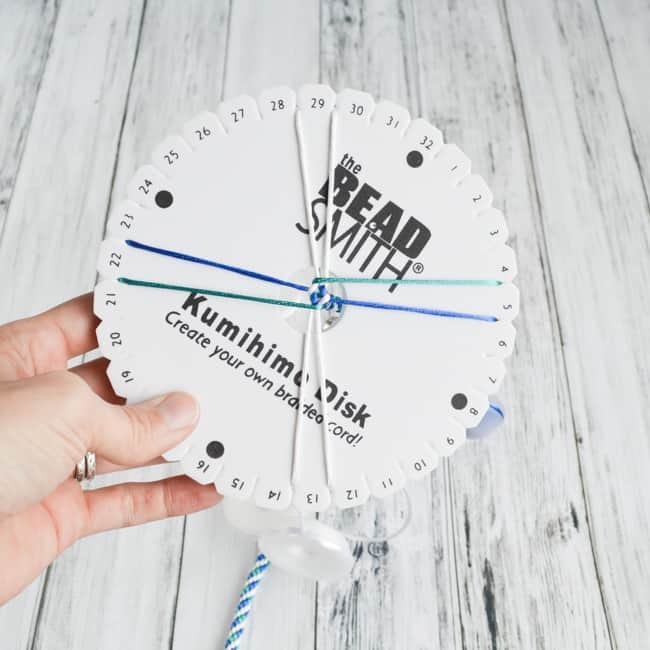 I love bringing my kumi loom on airplanes – it’s such a portable craft and always a conversation starter! 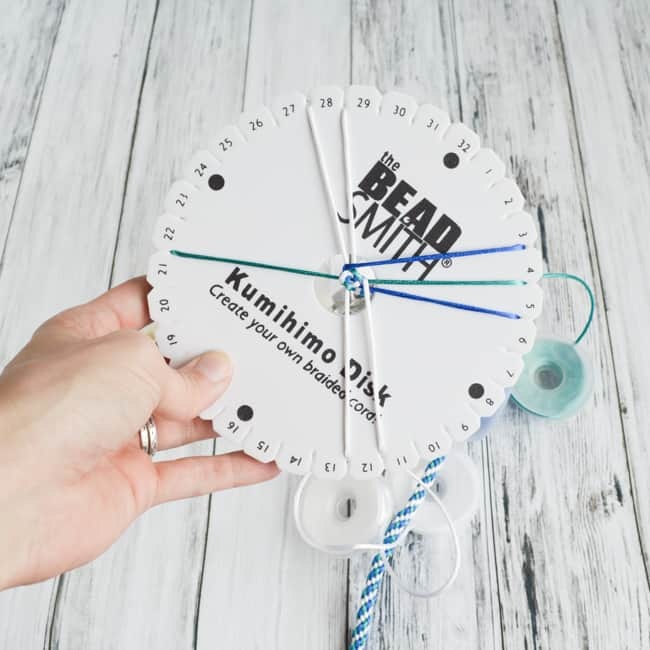 When I first started braiding, I realized that there had to be a more efficient, quicker way to braid that didn’t involved constantly rotating the disk a quarter turn. Once you get the hang of this no-turn braiding method, it is a lot faster than the usual way of kumihimo braiding. I’d say it’s at least twice as fast for me! I’ve only tried this method on the typical 8-strand round braid so far, but I’m sure it can be adapted to fit other braids, as well. It may feel odd at first or difficult to keep track of, but I’m confident you’ll get the hang of it soon! 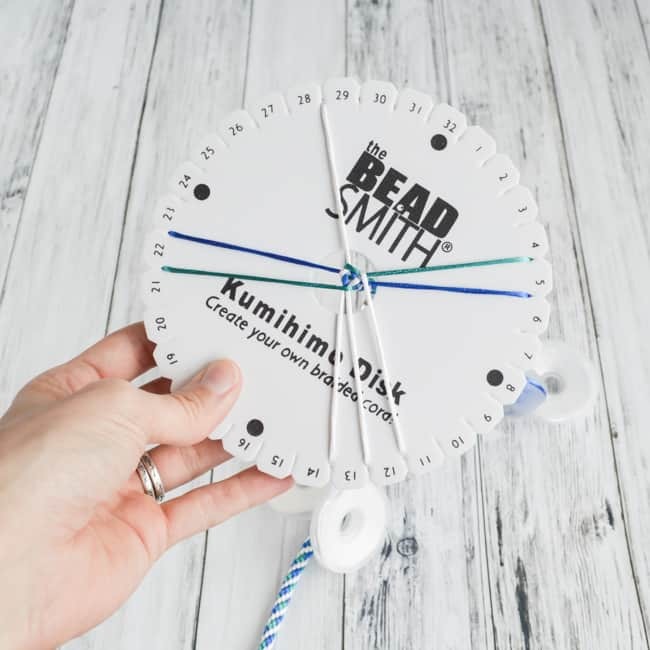 All you need is your round kumi loom with your usual bobbins and cord. 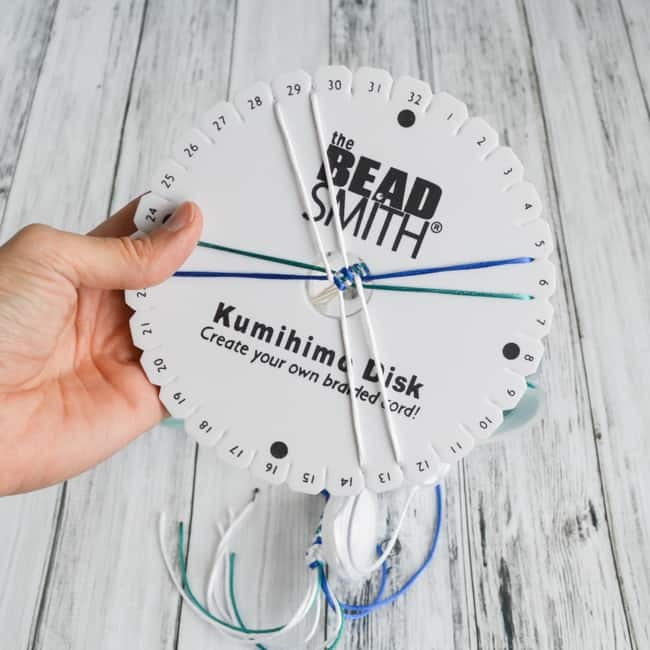 A comprehensive kumihimo starter kit can be a great way to get going if you’ve never played with kumihimo before! …And bring the bottom left thread up. Bring the top right thread down, as usual. Now, do not rotate your disk! Proceed to the next thread going counter-clockwise from the one you just placed (in my example the turquoise thread on the right). Bring it across to the left. On the side you just transferred over to, grab the top “third” thread and bring it over to the right. 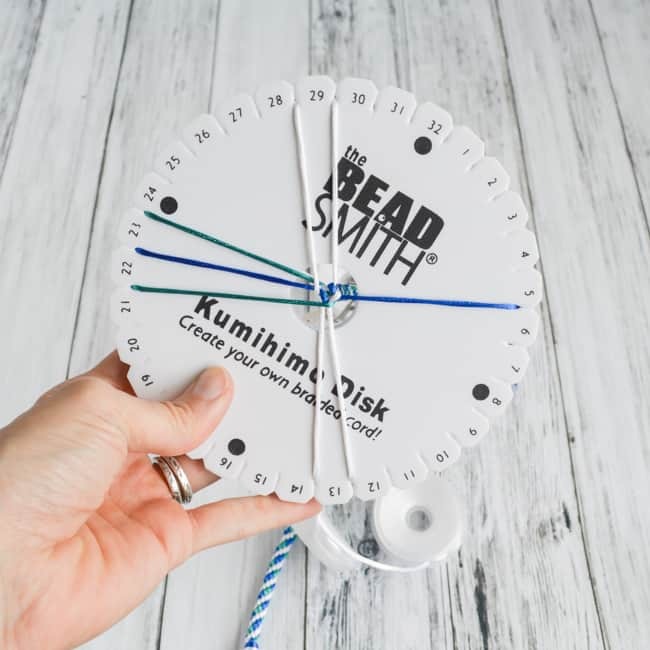 Once again, do not rotate the disk and proceed to the next thread, counter-clockwise, from the one you just placed (in my case, the top right white thread). Bring it down. Then, bring that left-hand third thread up. Proceed to the next thread counter-clockwise (left-side blue in the photo) and bring it right. Grab that third thread and bring it left. 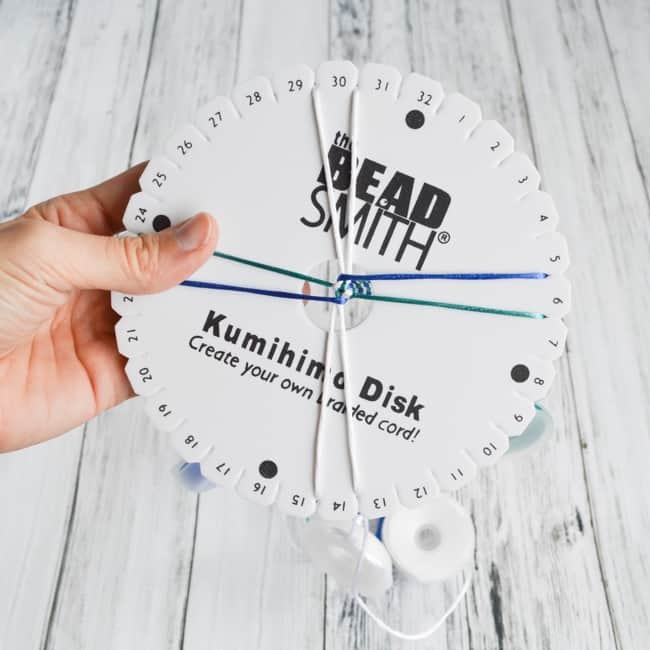 Congratulations – you’ve finished an entire circuit of kumi braiding without rotating the disk a full turn! Because the threads do “walk,” you will need to adjust your grip by one notch’s width to keep your orientation each time you make a full circuit. That’s a lot less turning! It’s super easy to remember this method if you just think about moving counter-clockwise. 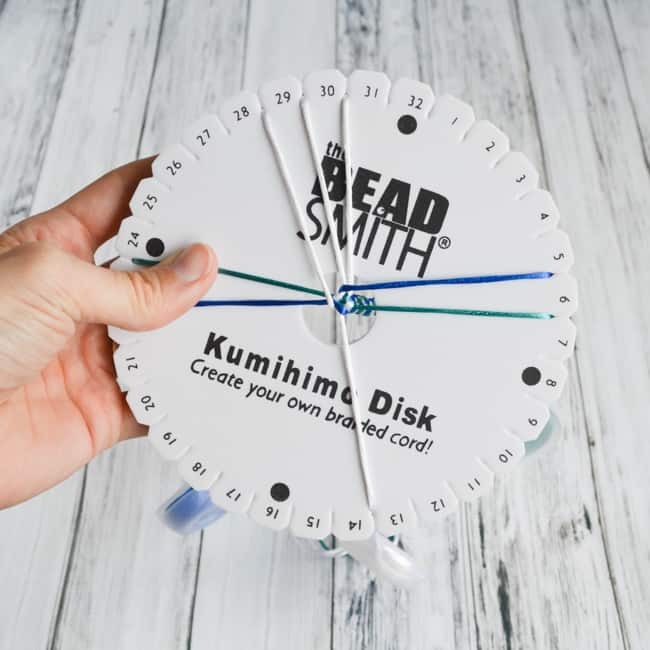 You always bring a thread across, even up the sides so there are two threads, and then proceeded to the next thread counter-clockwise from the one you just placed. I don’t know (yet!) 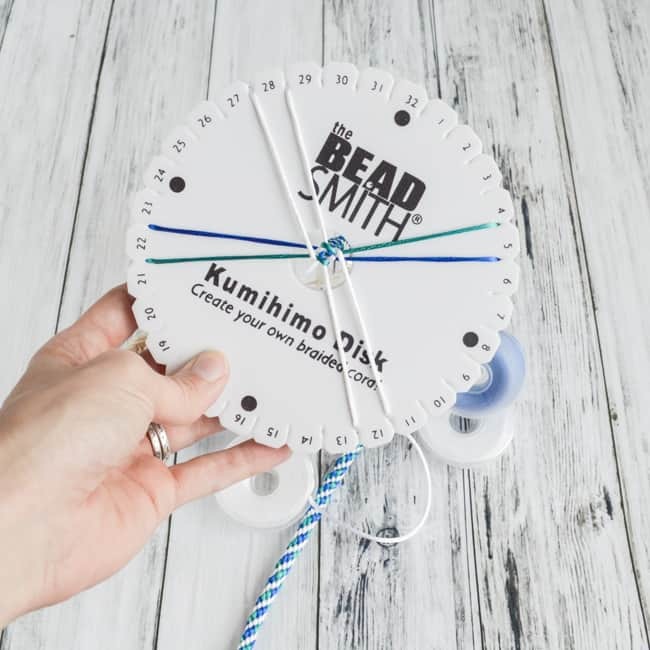 how to adapt this method to flat braids because I currently have a round disk. As I mentioned above, I love brining my kumi loom on airplanes. 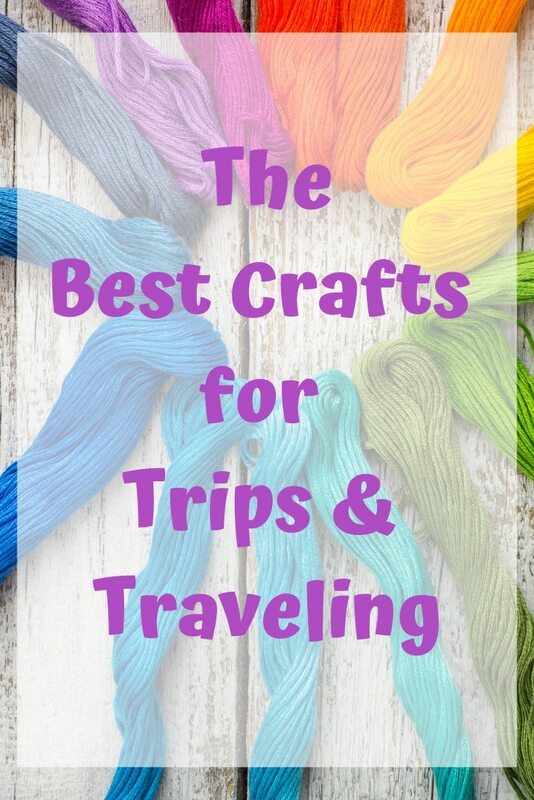 If you’re looking for other easily portable travel craft ideas, please check out this post of my five best crafts for traveling! 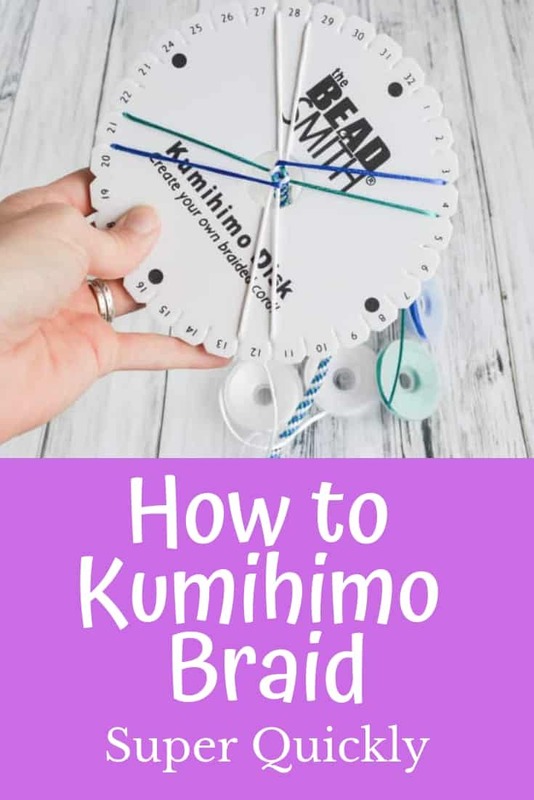 Have you tried kumihimo braiding? What’s your favorite use for the woven braids you create? I’m confused. If I follow which threads you say to move when, you’re working counter clockwise, not clockwise. That is so incredibly embarrassing! You’re absolutely correct, you should do as pictured and proceed counter-clockwise. I’ve just updated the text! I’m new to this craft, and really appreciate this tip!